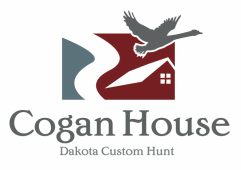 Dakota Custom Hunt customizes every agenda to each individual or group providing a guided or unguided hunt, up to the minute game location and acres of prime hunting land that could support a week long hunting trip or more. Located in the middle of the Great American duck and goose fly way and surrounded by an ideal hunting area with deer, pheasant, geese, duck and turkey. We have a habitat that attracts all sorts of game. The area is rich in cropland, wooded river breaks, food plots, the Missouri River and marshes. We welcome traditional hunters, archers, muzzleloaders and fisherman to Cogan House and can ensure a great time in the field or on the river.